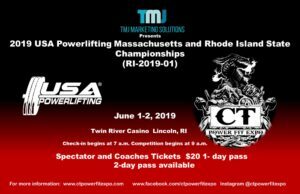 Saturday, June 1st and Sunday, June 2nd Join the CT Power Fit Expo at the 2019 USA Powerlifting Massachusetts and Rhode Island State Championships. 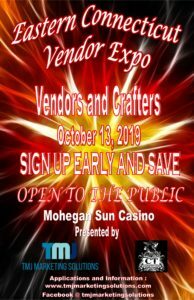 Event sponsored by TMJ Marketing Solutions, LLC. 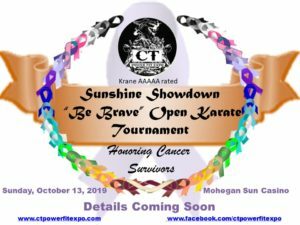 CT Power Fit Expo presents the 2019 USA Powerlifting Northeast Regional Championships and the 2019 USS CT State Championships on July 27-28, 2019 at Mohegan Sun Casino in the Uncas Ballroom. Sponsored by TMJ Marketing Solutions. Join the CT Power Fit Expo in Georgia presenting an exciting 2 day event featuring USA Powerlifting and USA Weightlifting in the 5 Bar Showdown, the Southern Bells Classic Kettlebell Sport Competition and Grappling Industries in @CT Power Fit Expo Atlanta BJJ GI and NOGI Round Robin Tournament on August 3rd and 4th at LakePoint Champions Center.